How do I enable eBay Strikethrough Pricing? Strikethrough Pricing is an older eBay feature that is not available for all sellers. Here's a quick guide to understanding the feature, and enabling it (if available to you). What is eBay Strikethrough Pricing? Strikethrough Pricing is an older visual feature provided by eBay to certain sellers. Just like in-store discount signage often shows a red line through the normal price, eBay Strikethrough Pricing crosses out a previously-listed price to show that an item is currently on sale. Can I Use eBay Strikethrough Pricing? As of 2018, eBay has revoked this setting for new sellers. If your account has Strikethrough Pricing enabled, you can still take full advantage of this feature. Please note: While there hasn’t been an official release from eBay in regards to removing this feature, other sellers have asked eBay about this functionality on public forums, and have received answers here and here. Download an Inventory Upload Template from the Uploads page or perform an export of your eBay inventory from the Pricing Manager. Place the price that you wish to be struck out within the Retail Price column. "Retail Price" will be struck out, and "Your Price" will be the item that displays on the listing. "Your Price" will also fluctuate given any pricing strategy rules attached to the item. 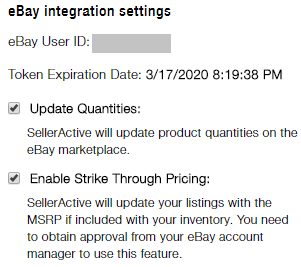 Enable the setting within the eBay integration tile.